Grooves provide bite and help put backspin on the ball. Cleaning and sharpening the grooves of your golf clubs may be something that you don't consider doing that often. But grooves are vital to performance on the course. Properly cleaned and honed grooves help with the backspin of the golf ball. Dirt-clogged and worn-down grooves won't bite or give you the spin you're looking for. 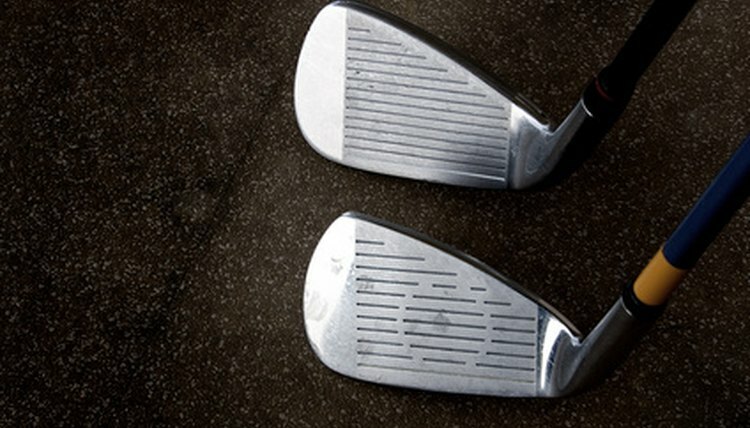 Repairing the groove face of your clubs is relatively easy, if you have the proper tools. Clean the face of your clubs, including the grooves. Use warm, soapy water with a couple of tablespoons of liquid dish detergent and a scrub brush. Get as much of the built-up debris from between the grooves as you can. Run masking tape along the ends of your grooves. This will keep your groove sharpener from damaging the face of the club should you accidentally slip out of the groove. Draw the groove sharpener through each groove using a 45-degree angle at first to start the process. You don't want to use much force at first. Do the 45-degree angle approximately five times, or until you begin to see the surface of the groove begin to take on its original shine. Change the angle of the groove sharpener so that it's completely vertical. This will recreate the original depth that the grooves had when the club was new. Most groove sharpeners have a restrictor so you can't go past USGA depth, which is 0.02 inches. Put a drop of oil into the groove and use the groove sharpener to clean out the excess gunk.